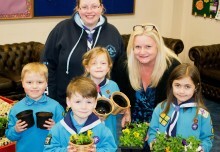 With the warmer weather upon us – and Bank Holidays looming – spring is the season for sprucing up the house and garden. Whether it’s outside or in, now is the time that homeowners will be thinking about maintaining their metalwork, whether it’s essential maintenance or a whole new look. Whatever the reason, retailers can see solid home improvement sales this spring with Hammerite. 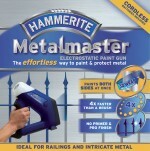 The latest solution from Hammerite is the Metalmaster, a 3-D applicator that is revolutionising metal painting. Using electrostatic attraction, the Metalmaster means paint is delivered only where it is needed; and paints all sides at once! Four times faster than a brush, and far less wasteful than a spray, the Metalmaster is sure to be a hit with home improvers who want professional results fast but don’t want to waste resources. And there’s even better news for retailers: the special refill canisters mean that the Metalmaster is certain to encourage repeat sales. Specialists in Metal care, Hammerite has been the name to rely on for quarter of a century. The Hammerite Metalcare range is available in a wide selection of colours and finishes include Hammered, Smooth and Satin. Offering long lasting protection, Hammerite has the perfect paint for every project.